With Arcadia and Mt. SAC looming close on the horizon, we thought it would be fun to take a look at the relays that aren't in the official CA track meet line-up. Although the State Meet only has the 4x100 and 4x400, many other relays have become very important in the early- and mid-season invitationals. We've collected the top 25 marks in each of these relays -- DMR, 4x800, 4x1600, 4x200 1600 SMR -- over the last four years. What you'll notice is the fastest marks in each category have mostly been achieved at the Mt. SAC Relays and seven of the 10 category-leading marks were set in 2016. While most of the category-leading times have been run at Mt. SAC, a breakdown of the top 10 in each category reveals that 40 percent of those marks were achieved at Arcadia. Mt. SAC is a close second at 38 percent. So, 78 percent of the top 10 times over the last four years in those five relay categories have been set at either Arcadia or Mt. SAC. Other meets where top 10 marks were achieved: Stanford Invitational, California Relays, New Balance Nationals Outdoor, Penn Relays, USATF Junior Olympics, Bobby Bass Invitational, Chandler Rotary, Long Beach Poly TrackRabbit, Griffin Relays and Texas Relays. No school appears in the top 10 across all five categories in both genders more than Great Oak. The Wolfpack slot 26 times in the top 10, appearing in seven of the 10 categories (sans boys and girls 4x200 and boys 1600 SMR). Great Oak is most dominant in the girls 4x1600 with six of the top 10 marks, and boys 4x800 with five of the top 10 marks. The next closest is a tie between Bellarmine and Long Beach Poly, each with seven overall top 10 times. Bellarmine's strength is in the distance where it matched Great Oak's high of four top 10 marks in boys DMR. So, yes, those two programs have produced eight of the 10 fastest boys DMR times over the last four years. Long Beach Poly is scattered across five categories led by two marks in each the girls 4x800 and girls SMR. More than 40 schools are represented among the top 10 across the five relay categories. The only category-leading mark set in 2018 was the Great Oak girls in the 4x800, running 9:03.31 at Mt. SAC. The Wolfpack ladies did that two weeks after running what is now the No. 2 time, 9:05.34, at Arcadia. 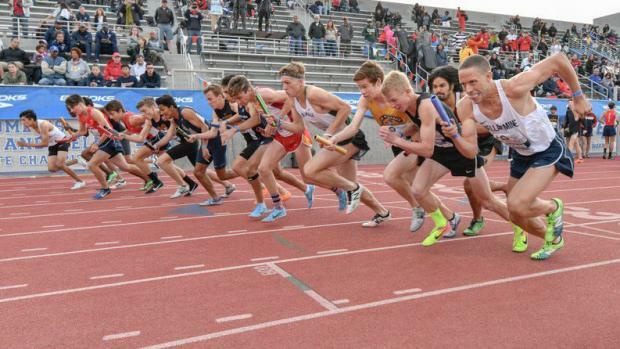 On the following pages, we've broken each relay into a separate page with boys and girls rankings following a lead-in that highlights the top marks so far in 2019 and where they may rank -- or not -- among our top 25 over the last four years.